With the recent scare of mercury in high fructose corn syrup many parents are worrying about the foods they have been feeding their children. Sweet snacks and treats are large concerns as they often contain a large amount of the potentially dangerous substance. Many parents are now looking for alternative foods they can feel comfortable giving their children. Companies that do not use high fructose corn syrup in their foods, such as Newman’s Own Organics, are becoming even more popular due to this new health risk. However, parents can go an extra step and choose to make their own treats rather than buy prepackaged foods. Not only is this healthier and often less risky, it also cuts out the negative effects of packaging and transportation. 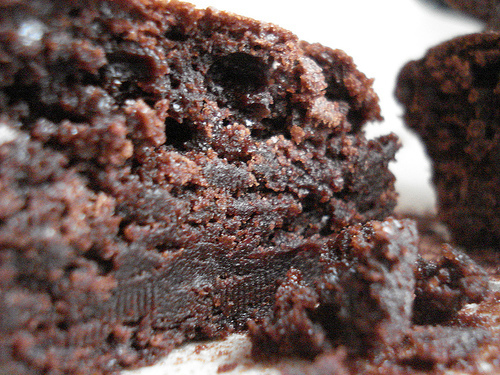 One favorite healthy treat in my house is Black Bean Brownies. At first this recipe seems odd, and for some not the least bit appetizing. But these chocolaty goodies have been making my kids smile time and time again. I have served them to friends and family without telling them exactly what they are eating and have never received a complaint. If you are feeling adventurous give these a try! These are just the basic ingredients, feel free to change them up to meet your dietary standards. Vegans might enjoy replacing the eggs with bananas to maintain texture. Use organic and natural ingredients when possible. Pour drained beans into a blender, set on puree and blend until smooth. Add in the rest of the ingredients and continue blending until evenly mixed. Pour bean mixture into a greased 8 by 8 pan. Bake in oven for 30 minutes, or until toothpick placed in the center comes out clean. Let them cool and enjoy. These chocolaty brownies are so yummy you would never guess that they also have the goodness of beans baked right into them. Go on and try a batch for yourself and let me know what you think. Damn I wish I had a blender! Reminds me of my zucchini brownies, a great way to use up ALLLLL that zucchini and you’d never know there was VEGETABLES in your brownies. They actually add a lot of moisture! Oh, have you ever tried making these with dried beans instead of canned? I like cooking up my own beans whenever possible, though I find it makes a difference to the final product in SOME recipes (though not most). Then you don’t have to worry about salt or BPA or whatever else might be in cans. It’s not a lot more work if you boil up a lot of beans at once, and freeze the extra. wow, were these good!! i subbed banana for the eggs, and date sugar for the cane sugar to suit my preferences. love, love, love them! i shared them with half a dozen others who all loved them too, several of us agreeing they were the best brownies we’d had in a long time. i love how they’re so dense and fudgy. thanks so much for the recipe! no flour? I’m going to give these a try! This recipe is great! I was so eager to taste these when they came out of the oven that I didn’t even let them cool. I think the taste better once they are room temperature or refrigerated but still good nonetheless. I substituted agave nectar for the sugar and the batter was really thin and I also added chocolate chips and chopped raw walnuts – yum! I will try this recipe again with raw sugar to see what the difference is with the texture, it is definitely different than a brownie made with flour but very tasty! I made these brownies this past weekend – they tasted absolutely fabulous! I used 1/2 C of maple syrup in place of sugar and 2 tsp of Kahlua instead of vanilla. I might use a tad less maple syrup next time or use a mix of maple syrup and apple sauce. Thanks for this keeper of a recipe! Does anyone have the Nutritional Information per serving for this recipe? These are great, can use 2 ripe bananas instead of the eggs, and for those without a blender, a potato masher works really well! These are awesome!!!! the only change I made was instead of sugar I used 1/2 cup light agave nectar, tastes great and makes it even better for you than refined sugar! would definitely recommend these to everyone! I am making these right now, using raw organic sugar and also adding in a tablespoon of instant espresso. I used dried beans (boiled for 2 hours). I have nothing to compare it to as to how it will come out, but the batter sure tasted good!! These were decent. The flavor was quite good, but the texture is definitely not like a regular brownie. Almost like they were too moist, but not in the fudgey way you want a brownie to be moist. My brother-in-law said it was almost like a mousse or other creamy dessert that was chilled to be semi-solid. They definitely were only semi-solid, they fell apart easily and are best eaten with a fork. I substituted 1/2 cup agave nectar for the sugar, and used only the yolks of the 3 eggs to cut down on the other liquids in the recipe because of that. With these modifications, I figured out the nutritional info. If you get 9 brownies from 1 recipe, then each brownie has 164 calories, 7 g fat (1 g saturated), 3 g fiber, and 4 g fiber. Each brownie is 3 Weight Watchers points. There are so many variations on these healthier brownies. This site shows the simple one with no added eggs or oil. Make that http://www.blackbeanbrownies.com (I didn’t do the first link correctly in the previous comment). I don’t think using a box brownie mix is healthier or better than this recipe. I love all the variation on this recipe–from those who make it w/o sugar to those who make it vegan. I, for one, will be blending it with my old 4-H brownie recipe. Just made this one tonight and my husband and I are blown away. Cakey, light, and airy. If he’d let me, I’d devour the whole batch. Thank you! Earlier today, I would have knocked down an old lady on the street if it meant I could steal her brownie and satisfy my craving. I decided that, given the fact that I’m seriously needing to make a more conscious effort to eat healthier, I’d give these brownies a go. I wish they would have tasted and felt more like a “real” brownie. Thanks for posting this, but my search for the perfect healthy brownie recipe continues. Any suggestions for how to modify this recipe to make a white bean blondie? Most of the recipes I’ve found online call for either flour or oats and I don’t want to use either.